As a parent, it’s heartbreaking to know that your newborn child has disabilities and will need surgery. You fear for your child’s life and hope that the surgery will go well. On top of this mountain of stress, you worry about how you’re going to pay for it—even if you have insurance. The family traveled to Houston for appointments with Dr. Shah in December 2016 and March 2017. He told Rafe’s parents that surgery should be performed before Rafe was 18 months old for the greatest chance of success. Samuel is a combat veteran of the United States Army, and Rafe was on his military insurance plan. However, it covered just the first two visits, and the Hibbens could afford to pay only a portion of the cost of the $25,000 operation out of pocket. “Texas Children’s ended up being ’out of network’ for us, which was a huge bummer because we had already spent a lot of our own money to fly there and see Dr. Shah,” Jessica recalled. The procedure was successful, and from the minute Rafe woke up after his one-and-a-half hour surgery, his parents could tell the difference. His vision continued to improve over time. “His eyes were bloody at first, but they were straight from the get-go,” Jessica said. “Over the next few months, between Dr. Shah and his vision therapist in New Mexico, we started seeing a difference. His brain was really connecting with his eyes. Without surgery, his brain wouldn’t have gotten that chance. 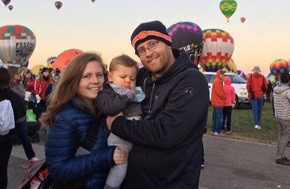 It impacted his entire quality of life.” Throughout it all, Texas Children’s physicians and staff provided the Hibbens with the comfort and hope they needed. Today, the Hibbens have resumed their normal lives in New Mexico. Rafe, who is now 2 years old, loves swimming, snuggling with his parents and walking around with his walker—all while being able to see clearly.